The increase in the number of countries that have abolished the death penalty since the end of the Second World War shows a steady trend towards worldwide abolition of capital punishment. 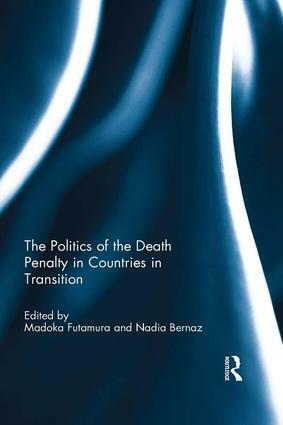 This book focuses on the political and legal issues raised by the death penalty in "countries in transition", understood as countries that have transitioned or are transitioning from conflict to peace, or from authoritarianism to democracy. In such countries, the politics that surround retaining or abolishing the death penalty are embedded in complex state-building processes. In this context, Madoka Futamura and Nadia Bernaz bring together the work of leading researchers of international law, human rights, transitional justice, and international politics in order to explore the social, political and legal factors that shape decisions on the death penalty, whether this leads to its abolition, reinstatement or perpetuation. Covering a diverse range of transitional processes in Asia, Africa, Latin America, Europe, and the Middle East, The Politics of the Death Penalty in Countries in Transition offers a broad evaluation of countries whose death penalty policies have rarely been studied. The book would be useful to human rights researchers and international lawyers, in demonstrating how transition and transformation, ‘provide the catalyst for several of interrelated developments of which one is the reduction and elimination of capital punishment’. The politics of the death penalty in post-conflict Sierra Leone: an opportunity for reform or a missed opportunity?